Every Year on “Big Satdee” All Saweds and their Guests will gather near The George Hotel at 10pm. 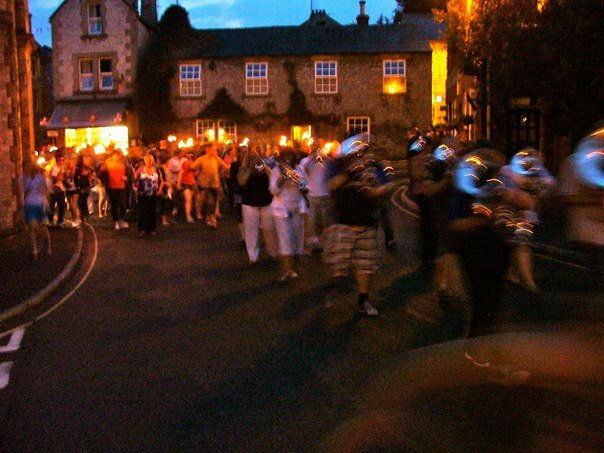 Tideswell Band will be there, probably a bit worse for wear after a hard days playing, marching and of course drinking. 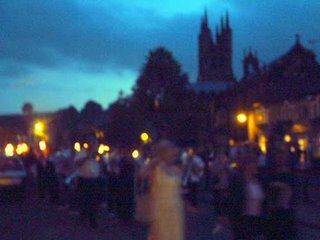 The air will be thick with anticipation and fag smoke….The Torchlight is about to begin. First of all the band leads and the revelers follow. All flanked by Torch bearers. A sort of Morris dance is taken up by all the revelers. Where The dancers take 4 skips forward in time with the music. When the Music changes to the “Bridge” you swap sides with your partner, shout “Hey” and wave your Hanky in the Air, and then back again. It really is quite exhausting but amazing fun and brings my childhood flooding back to me every time I take part. I lifted this picture (below) off My cousin Danny Ayers’s website…It’s a bit Fuzzy but you get the general idea. And for those of you who need a Video. Here is the same tune being Played at the neighbouring village of Litton. This entry was posted in Derbyshire, TIDESWELL and tagged TIDZA PROCESSIONAL by Tideswellman / Old Man Paints. Bookmark the permalink.